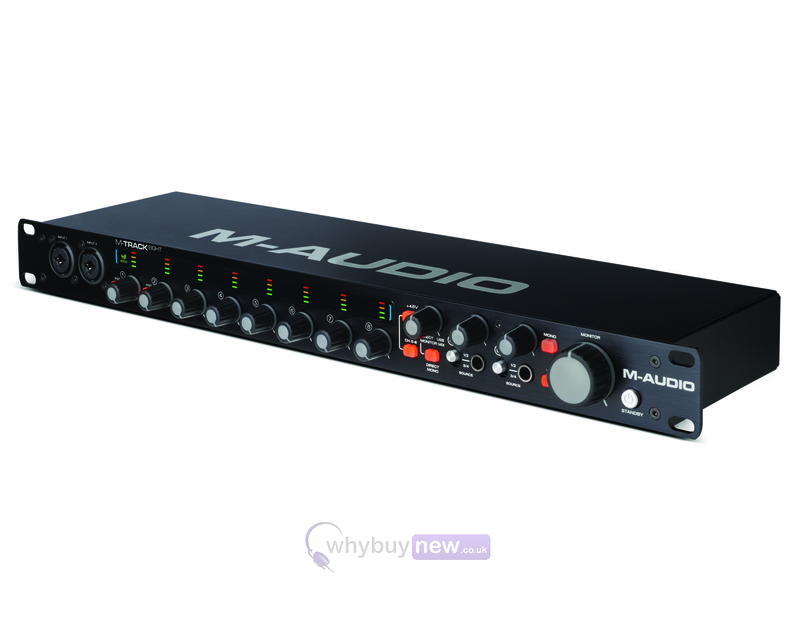 Here we have the M-Audio M-Track Eight Audio Interface in B-Stock. The B-Stock versions would have been on display at a training evening or trade exhibition only and will come boxed 'as new' with all accessories and a 1-year warranty. 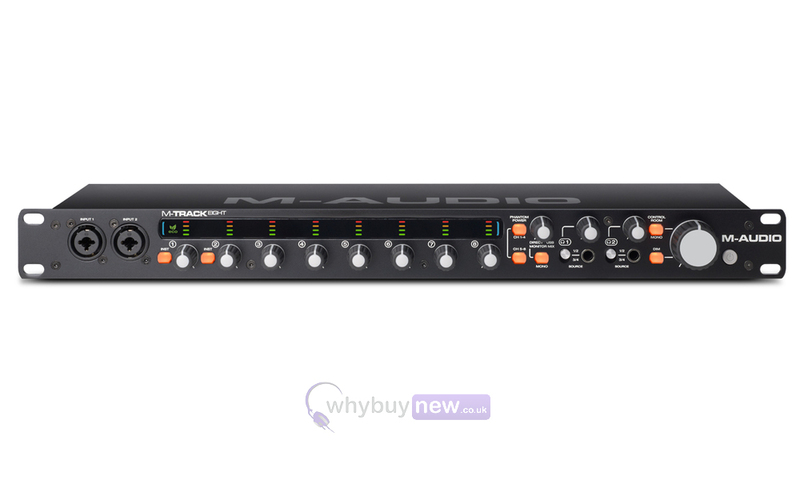 The M-Audio M-Track Eight Audio Interface is ideal for any multi-mic arrangement, from drum kits to groups of people. The M-Track Eight has a practical design, user friendly interface and professional features as well as Cubase 7 LE to provide you with the ultimate audio interface. Add a professional edge to your studio with the M-Track Eight from M-Audio. This eight-input USB 2.0 audio interface enables you to track large music ensembles, record the band, or mic an entire drum set with pro-grade audio components and a myriad of connections. Eight combo XLR+1/4" inputs accommodate nearly any source, from phantom-powered microphones to your favourite guitar, and eight dedicated outputs offer versatile playback options. The XLR inputs are designed to work with microphones and other Lo-Z sources, and the phantom power switch enables you to use condenser microphones by delivering 48v phantom power to the XLR inputs (Channels 1-4; 5-8). M-Track Eight also has two conveniently located inputs on the front panel that can be switched to allow instrument-level signals, so you can plug your electric guitar or bass directly into M-Track Eight and start recording. Individual gain knobs with meters help ensure the proper input level by providing real-time visual feedback. 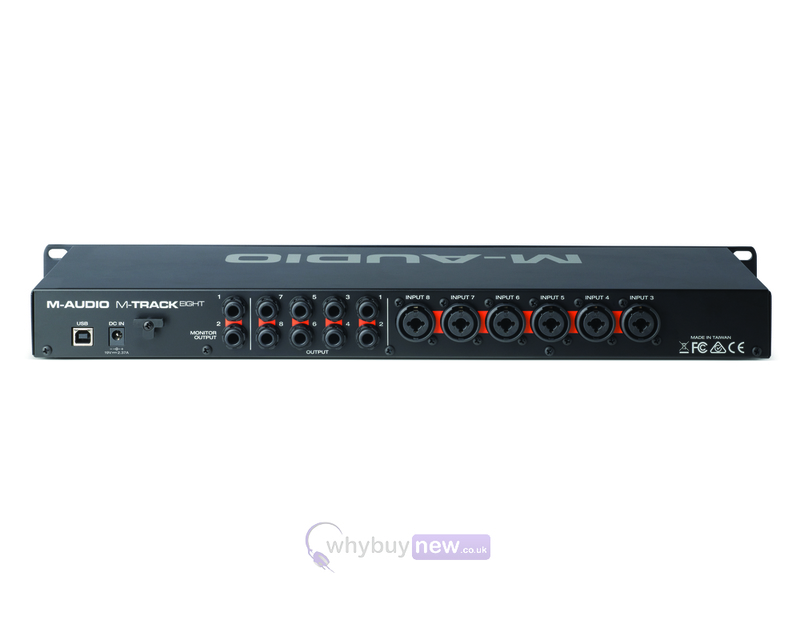 M-Track Eight features pristine and precise audio recording with up to 24-bit/96 kHz resolution. Each input channel is equipped with a high-headroom input that features M-Audio's sought-after Octane Preamp Technology. The result is a robust signal path for clean, professional sound. In addition, each input comes with dedicated line-input circuitry so you can record and track with your favourite external preamps. M-Track Eight offers ultra-low latency monitoring of the input signal-either through the speakers or via headphones. The USB/Analog Direct Balance knob adjusts the balance between the direct inputs and the playback from your computer software for accurate monitoring during tracking and recording sessions. Flexible output routing lets you send signals to outboard gear or analog mixers for summing or processing. Additionally, two headphone outputs, located on the front panel, have their own level and selectable-source controls for creating custom headphone mixes. 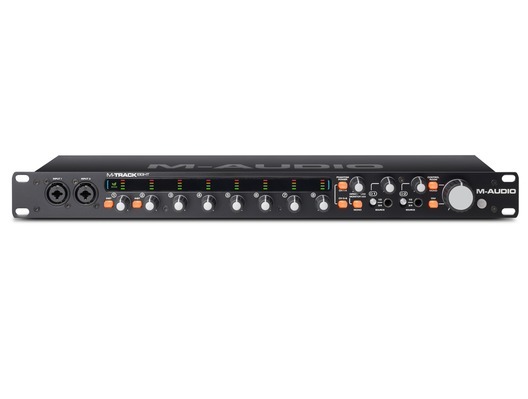 In addition to outstanding audio performance, M-Track Eight connects to your computer via USB 2.0 and easily integrates into your studio with its standard 1U 19" rack size. With a single USB cable, M-Track Eight creates a two-way audio connection with your Mac or PC, enabling you to record directly into your favourite DAW or playback audio to mix and master your tracks. Plus, Cubase 7 LE comes bundled with M-Track Eight for out-of-the-box music creation and gives you a powerful software environment to record, edit, and bounce down your songs. The M-Track Eight software suite also includes an impressive selection of plugin effects from Waves Audio Ltd. TrueVerb delivers a broad, natural reverb with an easy-to-use interface. AudioTrack offers a remarkable EQ, plus gating and compression. Plus, you can add a professional touch with the Eddie Kramer Effects Channel, created with legendary audio guru Eddie Kramer. World-renowned, L1 Ultramaximizer offers look-ahead peak limiting, level maximization, and high resolution re-quantization in one powerful plugin. Add depth and dimension while enhancing the groove with Manny Marroquin Delay. All specifications are measured at 20 kHz bandwidth.